What Does it Mean if My Business Has an Old Commercial Fire Alarm System? Posted April 2, 2019 & filed under Fire Alarm Systems. Is the fire alarm system in your commercial property on the older side? This should be a cause for concern. You’re going to need to take the right steps to make sure that your old commercial fire alarm system doesn’t put you, your employees, and your building at risk. Here is what it means if you have an older fire alarm system in place in your business. It might not offer the protection you need. If a fire were to start in your commercial building today, you want to know that your fire alarm system will spring into action and alert everyone about it. But if your system is old, it might not be able to do that. Many older systems aren’t equipped with the same features as new ones. As a result, it could take your system longer to register the presence of smoke and fire, which could put everyone in your building and the building itself in danger. It might require costly maintenance all the time. 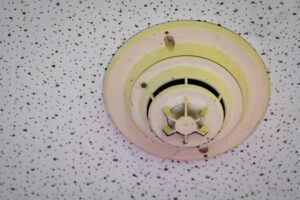 Older commercial fire alarm systems tend to need more maintenance and service than new ones. It might even feel like you’re calling on a fire alarm company to come out and help you every time you turn around. It’ll be enough to make you question whether you should think about replacing your old fire alarm system with a new one. It might not necessarily need to be replaced. If your commercial fire alarm system is extremely old and outdated, there’s a chance it could need to be replaced. But that isn’t always the case. You can often bring an old system up to speed and make it every bit as effective as a new system by obtaining replacement parts for it. You’ll be surprised by how cost-effective this can be as compared to replacing your system altogether. At Life Safety Consultants, we have the commercial fire alarm system products you need to bring your old system back to life. Call us at 888-557-0558 today to order parts for your existing system.